The U.S. space agency will, however, continue to depend on Russia to transport its astronauts to the International Space Station. The U.S. National Directorate of Aeronautics and Space (NASA) issued a statement declaring the near complete suspension of its cooperation with Russia. NASA employees are now barred from travelling to Russia before obtaining a special order, as well as forbidden to conduct teleconferencing, joint activities and e-mail correspondence with Russian counterparts. The conditions also include a ban on Russian officials visiting NASA sites. According to the American organization, this cooperation will last as long as NASA does not renew its own manned spacecraft launches. 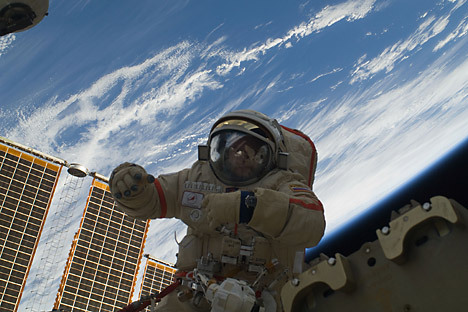 Since the closing of the U.S. space shuttle flight program, American astronauts have been delivered to the International Space Station by Soyuz ships, for which Russia receives $70 million for each astronaut transported. The Russian Federal Space Agency, Roscosmos, has not officially reacted to the statement. However, Deputy Prime Minister Dmitry Rogozin, who oversees the rocket and space industry in the Russian government, expressed scepticism towards the message, noting that cooperation between Russia and NASA was limited to working together on the ISS. According to Yury Karash, a member of the Tsiolkovsky Russian Academy of Cosmonautics, collaboration between Washington and Moscow as part of the ISS project will continue. “For the U.S., it will be forced cooperation, because at the moment the United States cannot send its astronauts to the station except on board the Russian Soyuz. However the events surrounding Ukraine and Crimea will push the U.S. to accelerate its work on the creation of its own manned spacecraft,” said Karash in an interview with the Interfax news agency. “Moreover, such actions by Russia, of course, would be another ‘wooden stake’ that Russia could drive into any possible future international projects with the participation of Russia and the United States. I would not do this,” said Karash. Cooperation with NASA began in Soviet times as joint projects in the fields of medicine, biology and geodetics in the 1960s. In 1972, the Soviet Union and the United States signed an agreement on cooperation in the peaceful use of outer space, and 1975 saw the famous “handshake in space” – the docking of the Soyuz and Apollo spacecraft. In the 1990s, NASA and Russia expanded their cooperation, including in the joint use of the Mir orbital station, which was essentially the predecessor of the current International Space Station. · Long-term research, including studies related to the preparation of a manned flight to Mars. · Exploration of outer space, including the establishment of manned stations on the moon as a first step in the solar system’s further development.